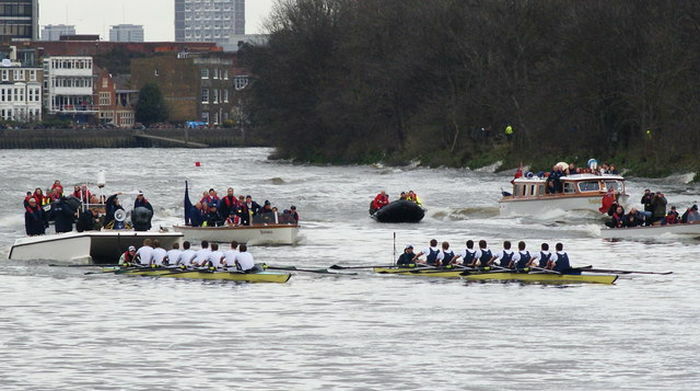 The men’s Oxford vs Cambridge boat race was founded in 1829, while the women’s race first occurred in 1927. The races have been broadcast on the BBC since 1938, securing the longstanding tradition’s status as a national institution. Signalling the end of winter, and perhaps even providing an excuse for an early-spring outing of the Pimm’s, the boat race is about as English as it gets. Hundreds of thousands of spectators are expected to line the banks of the River Thames on Sunday afternoon, and whether they are supporting the Light Blue of Cambridge or the Dark Blue of Oxford, the drinks are sure to be flowing. The sheer occasion of the boat race is enough to create a carnival atmosphere. The BBC’s TV viewing figures aren’t to be sniffed at either. In 2016 a whopping 6.2 million people tuned in to watch Oxford and Cambridge’s men’s crews battle it out for another year’s bragging rights, and 4.8 million tuned in to watch the women do the same. If Andy Murray is knocked out before the final, the boat race often beats the viewing figures for Wimbledon singles finals. Some may argue that rowing is too expensive a sport to go mainstream, but the amount of people who are making a point of watching the race year on year suggests that there is undoubtedly something compelling about the spectacle. And to my mind, that something makes it more than worthy of our license fee if it is only the opportunity to poke fun at stuffy Oxbridge customs. Outside of the Olympics, the Boat Race is perhaps the most high-profile rowing event in the calendar. Almost two centuries of races between Oxford and Cambridge men and women have built up a weight of history that adds a thrill of mystique to proceedings. As a result, the Oxford and Cambridge crews attract elite level rowers to the university ranks like, for example, veteran Olympic gold medallist James Cracknell, who is set to row in the Cambridge nine this year. As we continue to battle to give women’s sport the same coverage as men’s, the boat race offers absolute gender parity unlike many sports on television. While rugby and football are still male dominated both financially and in terms of media coverage, the boat race is an even split between the men and women. This, then, is surely the type of progressively conscious sporting event that we should be advocating for seeing on our TV screens. The Boat Race marks an edge-of-your-seat day of racing - and even if that doesn’t excite you, the boat race has a habit of throwing up surprises. From the various Oxford boat mutinies down the years, to the unexploded WWII bomb found two years ago, there’s something for everyone, even if you don’t like rowing especially much. On Sunday we will see eight crews at the peak of their game, having given their blood, sweat and tears to ensure that they are at the pinnacle of their physical prowess. You would be hard pressed to find more dedicated university sports teams.